This is my 3rd and final post this week with a Remembrance Day theme. I would be remiss if I didn’t acknowledge that this is the 100th anniversary of Armistice Day marking the end of World War I. For a war that was so long ago, The Great War still plays heavily on the psyche of Canadians. This was not a war Canada chose to enter. At the time, our foreign affairs were dictated from England and when she declared war on Germany, the entire Commonwealth was dragged into it as well. This year, special ceremonies have been occurring all week to commemorate the 100th anniversary of Armistice Day. These ceremonies will culminate tomorrow on Remembrance Day. One of those ceremonies this week really touched me. 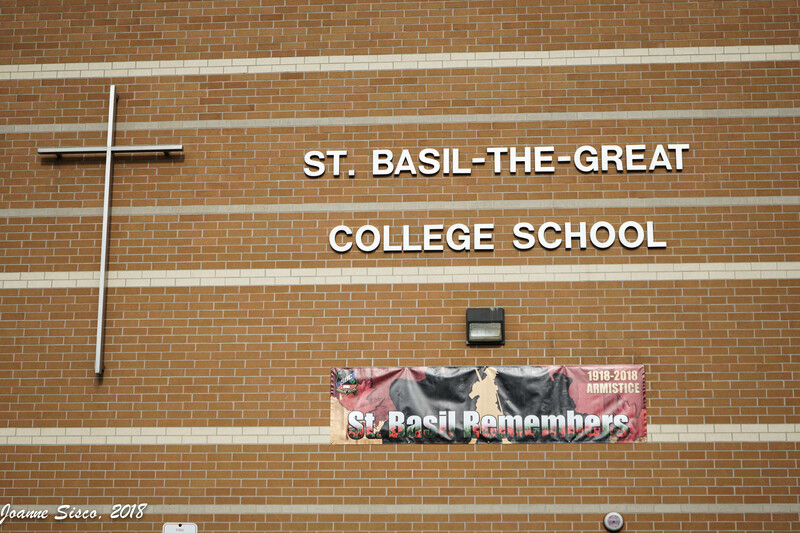 It was held at a Toronto-based school called St Basil-the Great. 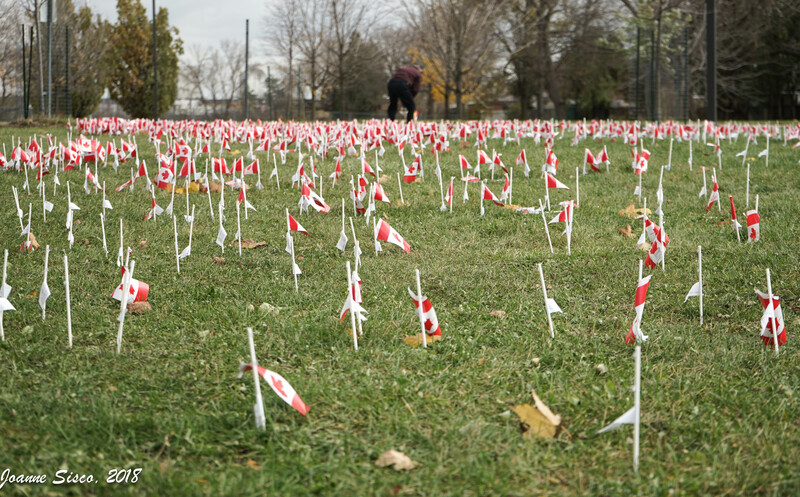 The students at St Basil planted hundreds and hundreds of small flags in front of the school in honour of those who died in service during World War I. 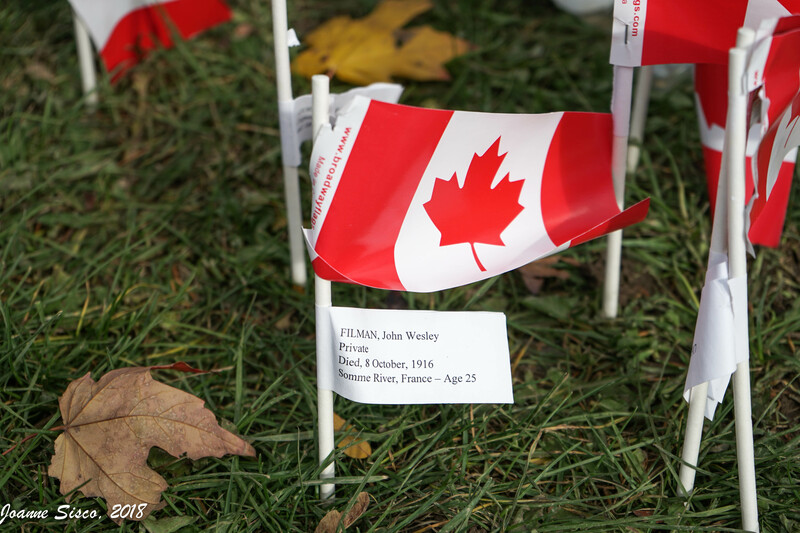 On each of those flags was the name of a Toronto-area resident who died in action during this war – one of the 60,000 Canadian casualties. The weather this week has been miserably wet with blustery winds. I half-expected to find that the majority of flags would have been blown away. While many were missing, it was heartwarming to see that the vast majority were still there. Even where flags were missing, the tributes were still attached. They even included remembrances of those who died in service in a non-fighting capacity. It seemed fitting that by the time I finished taking photographs, I was covered in mud. In spite of the freezing temperatures, the ground was still soft. It brought to mind the infamous muddy trenches of the front line. Again, my family history is connected to The Great War. When Germany invaded neutral Belgium on route to France in 1912, hundreds of thousands of young Belgians fled their country – many of them never returned. One of those men was my maternal grandfather. He was a young teenager when he fled his home for the Netherlands where he would later meet the Dutch woman he would marry following the war. Tomorrow I will be braving the cold to attend one of the many Remembrance Day ceremonies in the city. I will be honouring all those who fought to protect our freedom, those who served on the Homefront to support the troops far away, as well as all the members of my family who are no longer with us but have special ties to this day. My hope is that we will always be grateful and that we will honour their sacrifice by speaking out against practices that deny freedom and peaceful coexistence for everyone. The flags remembrance is such a beautiful tribute but it is your worlds in conclusion that bring it home for me. Sadly, as the last of our soldiers from the second ‘great war’ are leaving us, we seem to be setting ourselves up to make the same mistakes all over again. Will we never learn. Joanne I Thank you for this special tribute. My grandfather who I never met served in WWI. The stories told to my Dad of the trench warfare make my heart ache. Wonderful to see the school in Toronto making such a tribute to those soldiers from the Toronto area. Bravo to them and to you for facing the elements to bring us the story. So many stories, Sue – and all of them sad. We can only hope that the lunatics in charge don’t take us into a world war again. We can only hope Joanne. It makes me sad that there are high school students who have never been alive during peacetime. thanks Bethany. Even worse, I feel so sad for the refugees who have lived through war and have managed to escape – risking everything to start a new life here. That is an appalling situation. My heart breaks. Wonderful remembrance tribute. Also, you’re a wonderful blend of your parents. Actually my mother’s side was French, and it must have been because of one of the religious wars why they fled to Holland, and from there to Indonesia. I grew up without grandparents too and I’ve always envied those with large extended families around them. I know there can be a lot of drama that comes with close nearby family, but there is a lot of good too. In Holland contact with adult children and grand children is more limited than in the USA (generally speaking). Between generations there is more visiting, than sharing vacations or even weekends together. So, there is not as much “invasion” (if one would see it that way) of privacy. Also, in general, the number of kids and grand kids are lower than here. 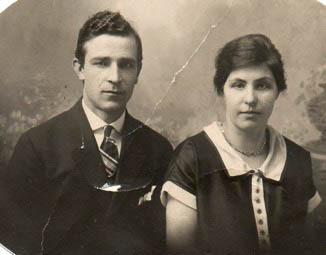 Love the photo of your grandparents. This is the only photo I know of that exists of my maternal grandparents in their youth. I don’t have any of my paternal grandparents. We had a very good turnout at the 11am ceremony, here in the Village! Did you hear the bells for peace ringing as the sun went down? I got to hear them in stereo as both the Catholic Church (on one side of me) and the Presbyterian (on the other) got to ringing them at the same time. Wow! You had a primo location for the bell ceremony! Sadly, nothing here. I had been downtown for the 11 am service, but I hadn’t slept the night before and went home for a nap. I didn’t make it back downtown 😕 I was really disappointed. Yes, if only people didn’t find it so difficult to be kind to others. Sigh. This is such a wonderful tribute Joanne. It’s always shocking to see the number of flags placed in Remembrance. This is a wonderful and fitting tribute to the brave men and women who must never be forgotten. Thanks Dan. Just when I think that ‘interest’ is starting to wane, I’m surprised at the size of crowds attending Remembrance Day ceremonies. It was good to see. It’s great that the children are involved in commemorating this historical event as morbid it may be. I have asked and listened to war stories from the generations before me. Men tend to glamorize the brevity of being in a combat. Back to your stories, I still enjoyed reading the love stories in between. I’m really leery of anything that glorifies war or being in the military. It’s just not. Yes, it does seem fitting that Remembrance Day events are often held in poor weather! Here in Calgary it was snowing, though I got my photos for my post the day before when it was cold but sunny. We were lucky – it was cold thanks to the wind, but the sun did manage to peek out for a while. Although there has been snow north of the city, I hope we don’t see any for a long time! I like that school project. Remembrance works best when it can be connected to a real person. This is the first time I’ve seen this personal touch. I like it and I hope there is more of that. Statistics are cold, but real people add meaning. This year there have been so many more personal stories told by the media in the lead-up to Remembrance Day. I agree Anabel. The Fields of Remembrance project here began as a way of getting individual communities to learn more about the local men and women who went off to war on the other side of the world and never returned. 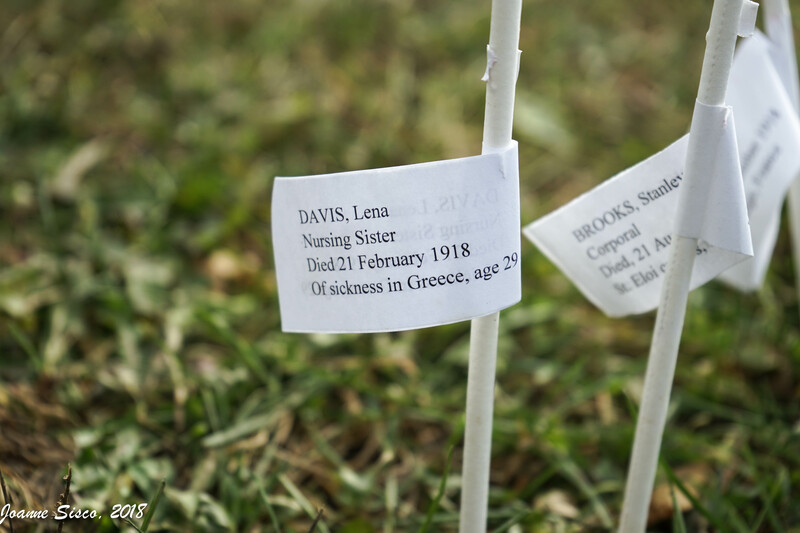 Over the years, it has been so lovely to see many of the crosses adorned with poppies, photos and sometimes little biographies laid by descendants. And to witness the excitement of children when they find the cross of a family member amongst the hundreds of others. It’s a good way to convey it to children who probably see it as yet more ancient history otherwise. omg – that sounds so wonderful. It sounds like a brilliant idea to keep young generations engaged with an important time in history. Wonderful post. I’m heartened to see that our two countries celebrate this holiday in some of the same ways. We too plant flags for the veterans. We also wear silk poppies in honor them. Usually they are given out by veterans collecting for families in need outside of stores or businesses. Do you have these as well? Yes, we have poppies as well usually sold by the Canadian Legion via collection boxes left in businesses or by veterans. I think it’s a universal symbol adopted around the world. Although I seen planted flags before, this is the first time I’ve seen the names of soldiers who died in action included on a flag as a tribute. It made the memorial so poignant and personal. Yes, I agree. It’s a wonderful tribute. I think you pretty much hit it on the nail. Encouraging freedom and peaceful coexistence is the best way for any country to honor its veterans. Sadly, it seems so very hard to do. As a mother who has a son in the army who served two tours in Iraq and one in Afghanistan, I not only think of those men and women who died in all of these wars to bring about peace, but I am also grateful that my boy came home. For so many every day is remembrance day. Jude, I’m such a stress bunny, I simply can’t imagine the constant fear that would live in your heart having a child on a war front. You certainly have so much to be grateful for!! Fortunately I don’t get stressed easily. And I did have use of his (old) Audi A3 convertible for six months! He is now in a very different area, so there should be no more scary placements. That’s good news and I hope he stays in a safe place!! Very nice post on this very important weekend. We must always remember or we will make the mistake of thinking choosing war over peace negotiations will be a quicker solution. It never is and families pay for generations. I have appreciated your effort this week to remind us of the historical connection to CN. Thanks Judy. I appreciate that feedback. 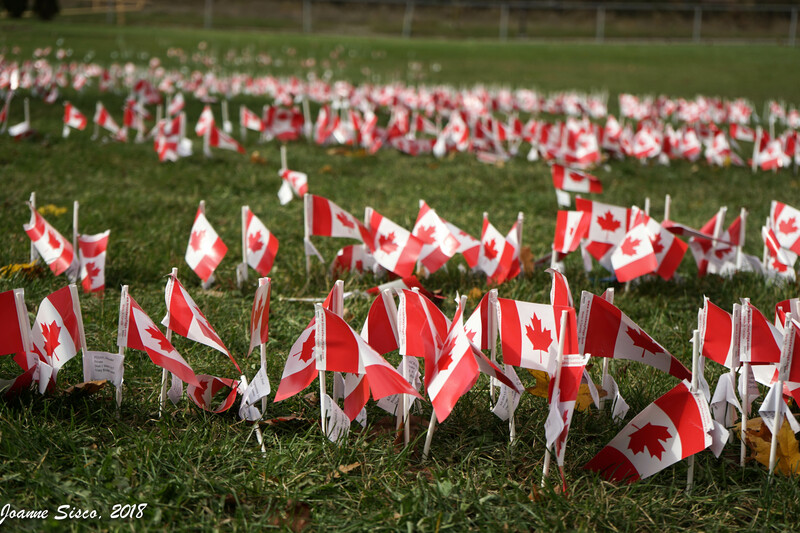 This year I’ve been deeply touched by the days and events leading up to Remembrance Day. This is a beautiful tribute to the men and women who served, and those that sacrificed all, and to your Grandparents as well. It was a bone-chilling one, Deborah, but for a few brief moments the sun came out. It was poignant, I cried, and in a few short minutes when the sun goes down, the bells in the city will start ringing – a 100 times to commemorate the Armistice. I’m sad I won’t be downtown to experience it. I saw the story about St. Basil-the-Great on the news this week. I thought it was a wonderful tribute and including the names of those who died would have so much more meaning for the students than just planting random flags. Great post. That was my reaction as well. These weren’t just statistics anymore – they were real people. Are you aware of the Bell Ceremony tonight at sunset? Hopefully there will be bells ringing in your area. WWI lives in the shadow of WWII and deserves to be remembered as the start of an area when the world changed. It should be a reminder of how quickly things can escalate, but I fear it does not hold the power at all. We are on the march to repeat history again. Perhaps that’s what we will do until the day we will either learn, or destroy all life for good. There has certainly been a lot written over the years about how WWI destroyed our ‘innocence’ and ‘romantic’ notions about war. WWII escalated war to a whole new horrific level. This ultra conservative populist trend right now alarms me. Enjoyed all 3 posts Joanne, we have to remember the sacrifices made so that we may enjoy freedom. I’m with you on trying to celebrate peace in these trying times. Thanks Karen. It’s interesting that the older I get, the more significant this day becomes to me. Beautiful tribute by the school – good to see a sense of gratefulness instilled in the scholars for the sacrifices made by their forebears. I say kudos to the school for making this a meaningful event for their students rather than just an academic exercise. I, too, celebrate peace, Joanne, and I love what you shared. I agree that we should speak out for peace and do all we can to keep it, while realizing that there may be a another time when it’s impossible to do nothing. I pray that time doesn’t come, but with the history of the world the way it is, I’m not sanguine about that. There is still too much conflict, too much prejudice, too much intolerance, too much greedy, etc for us to think that the lessons of the past have actually been learned. Let’s hope that we have learned something. So much is lost in war for all sides. We could all use a heaping helping of human kindness right now. Thanks a very lovely gesture! I hope you stay warm tomorrow. We have so much smoke in my area that all outside activities have been canceled. Oh dear, Jan – I didn’t realize you were so close to the wild fires. I hope you and your’s all stay safe! War is such a waste . . . but sometimes the alternative is worse. I’m glad that the “right side” won World War I and II. 60,000… The casualties of war, the scope of it makes my blood run cold. I love that they put the names and info on the flags. It’s lovely to see the old photo of your grandparents, Joanne. I can see a resemblance between you and your grandmother. Great big hug. My father always called it Armistice Day. That, he said, was what WWI was all about, and therefore he’d respect the sacrifices made in the name of peace. The engagement photo of your grandparents is delightful. Stay warm tomorrow. A fine post, Joanne, and a resounding finale to which I add my hopes too. Thanks Tish. Sometimes I despair that things have gotten totally out of hand and we are sliding back to those dark days. For now, I celebrate peace and thank those who fought to make it happen.